Washington: Longtime Donald Trump advisor Roger Stone pleaded not guilty on Tuesday to charges stemming from the ongoing investigation into whether the president's campaign colluded with Russia in the 2016 election. 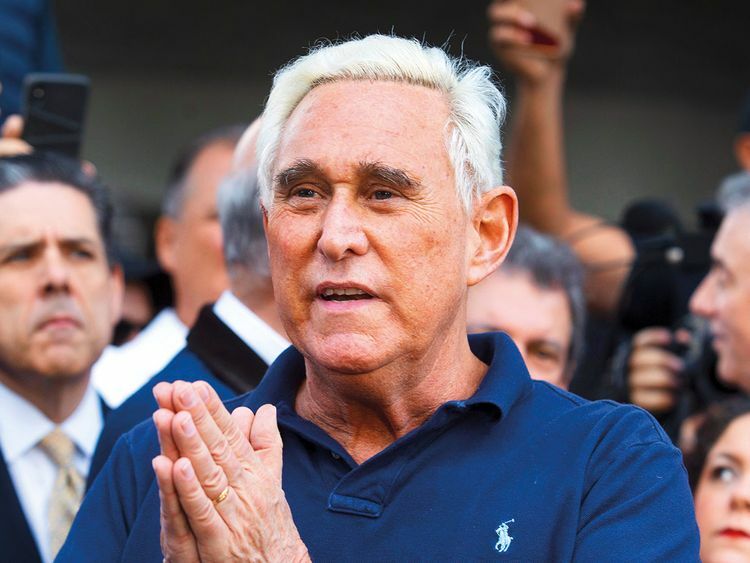 Stone, 66, is charged with lying to Congress, witness tampering and obstruction in relation to his contacts with WikiLeaks, whose publication of embarrassing Russian-hacked communications from Democrat Hillary Clinton's campaign gave a boost to Trump. Stone, a veteran Republican consultant who prides himself on his reputation as a political dirty trickster, entered a not guilty plea during an appearance in federal court in Washington. Stone is the sixth campaign associate of Trump indicted by Special Counsel Robert Mueller's team investigating Russian meddling in the 2016 vote. Trump has repeatedly denied any collusion with Moscow and denounced the probe by Mueller, a former FBI director, as a "political witch hunt." Stone arrived for his arraignment on a chilly winter morning to chants of "Lock him up" from some protestors. One waved a Russia flag and another held up a sign reading "Dirty Traitor." A pro-Stone demonstrator displayed a poster calling for contributions to a Stone Defense Fund. Stone, who launched his career as a campaign aide to Richard Nixon and has a tattoo on his back of the first US president to resign from office, has spent decades advising political campaigns. His association with Trump dates back to 1979, and he was one of the first to enlist when the billionaire real estate magnate launched his run for the presidency in 2015. The Mueller probe was launched in May 2017 and Acting Attorney General Matthew Whitaker said Monday that it was close to being wrapped up.